Font Book, Mac's main app for working with typeface allows you to create font libraries, install as well as remove fonts, as well as inspect and verify the fonts you have installed on your Mac. Contrary to what many people think, you don't have to be a graphics pro to have a large collection of fonts. There are a number of beginner-friendly desktop publishing programs available, as well as word processors with desktop publishing features. The more fonts (and clip art) you have to choose from, the more fun you can have creating family newsletters, brochures for your small business, greeting cards, or other projects. 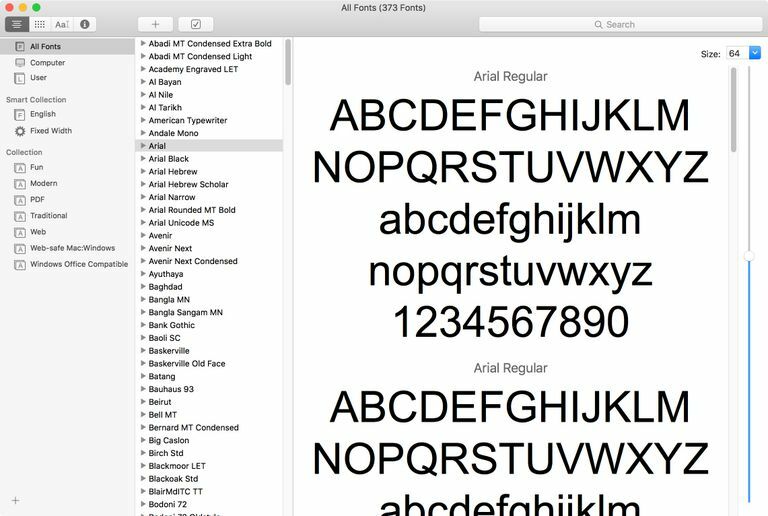 If you're just starting out, you may need to brush up on how to install and delete fonts using Font Book. To launch Font Book, go to /Applications/Font Book, or click the Go menu in the Finder, select Applications, and then double-click the Font Book icon. You can create additional libraries to organize a large number of fonts or multiple font collections, and then break out smaller groups as collections (see below). To create a library, click the File menu, and select New Library. Enter a name for your new library, and press Enter or return. To add fonts to the new library, click the All Fonts library, and then click and drag the desired fonts to the new library. Collections are subsets of libraries and are a bit like playlists in iTunes. A collection is a group of fonts. Adding a font to a collection doesn't move it from its original location. Just as a playlist is a pointer to the original tunes in iTunes, a collection is merely a pointer to the original fonts. You can add the same font to multiple collections, if appropriate. You probably have a handful (or more) of favorite fonts that you use frequently. You may also have fonts that you only use for special occasions, such as Halloween, or special fonts, such as handwriting or dingbats, that you don't use often. You can organize your fonts in collections so that it's easier to find a specific font, without browsing through hundreds of fonts every time you want to use it. Setting up collections can be time-consuming if you have a lot of fonts already installed, but it will save you time in the long run. The font collections you create in Font Book will be available in the Font menu or Fonts window of many applications, such as Microsoft Word, Apple Mail, and TextEdit. You'll notice that Font Book already has some collections set up in the Collection sidebar, but it's easy to add more. Click the File menu, and select New Collection, or click the plus (+) icon in the bottom left corner of the Font Book window. Type in a name for your collection and press return or Enter. Now you're ready to start adding fonts to your new collection. Click the All Fonts entry at the top of the Collection sidebar, then click and drag the desired fonts from the Font column to your new collection. Repeat the process to create and populate additional collections. If you have a large number of fonts installed, the font list in some applications can get pretty long and unwieldy. If you're an inveterate collector of fonts, the idea of deleting fonts may not be appealing, but there is a compromise. You can use Font Book to disable fonts, so they don't show up in font lists, but still keep them installed, so you can enable and use them whenever you want. Chances are, you only use a relatively small number of fonts, but it's nice to keep them around, just in case. To disable (turn off) a font, launch Font Book, click the font to select it, and then from the Edit menu, select Disable font name. You can disable multiple fonts simultaneously by selecting the fonts, and then selecting Disable Fonts from the Edit menu. You can also disable an entire collection of fonts, which is another reason to organize your fonts in collections. For example, you might create Halloween and Christmas font collections, enable them during the holiday season, and then disable them the rest of the year. Or, you might create a collection of script/handwriting fonts that you turn on when you need it for a special project, and then turn off again. In addition to using Font Book to manage your fonts, you can also use it to preview fonts and print font samples.